I always make such lofty goals. I really thought I would be able to squeeze in a quilt block or two after putting together my first order of Raggedy Ann and Andy clothes this past weekend. She wanted traditional. I had quite a few in her requested size cut out that I thought I might as well make them up in assembly line fashion. 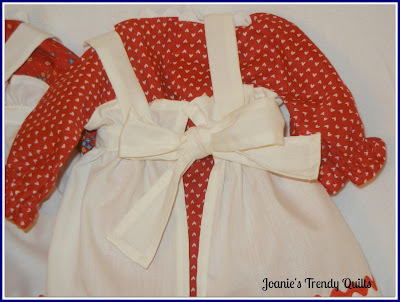 Working in this manner vs. one item at a time you can accomplish more sewing in less time. 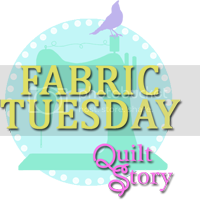 I never did begin the quilt that I had hoped, and didn't finish all the Raggedy clothes. I entertained myself by watching the first year season of Wild at Heart on Netflix. There are a total of ten. When I am tired I found watching these shows spurred me on to keep on going. This series began in 2006. Where have I been? This was the first I had ever come across this show. Anyways, the pictures show what I did accomplish this weekend. Dresses - one is with little flowers and the other mini hearts! His and Hers in traditional style. Once I finish the outfits I will begin with the dolls. 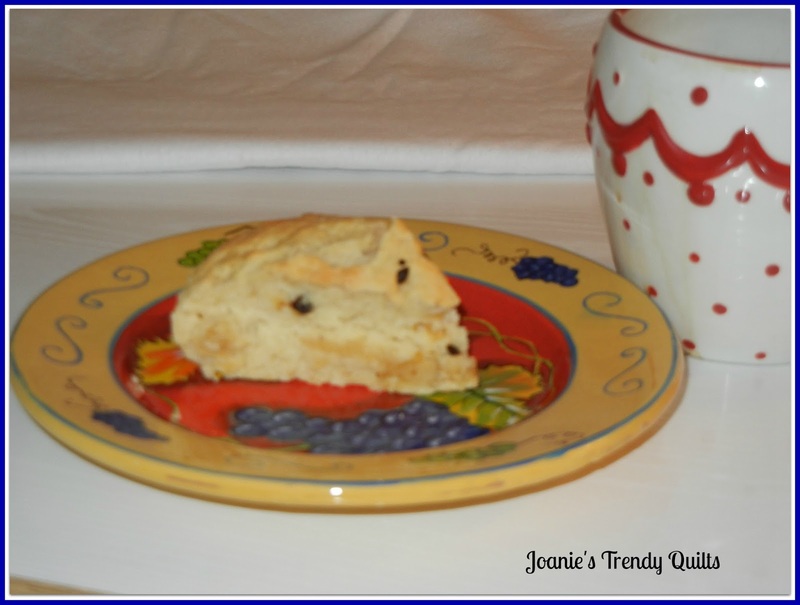 Here is a recipe for one of my favorite breakfasts. Heat oven to 375 degrees. Spray round pan, 9 x 1 1/2 inches, with nonstick cooking spray. Mix flour, currants, baking powder, baking soda and salt in medium blow. Mix yogurt and oil; stir into flour mixture until flour is moistened. Spread dough in pan. Bake 20 to 25 minutes. If you haven't already done so check out my new Etsy Shop. :) I only have a few items with more to come with various items. 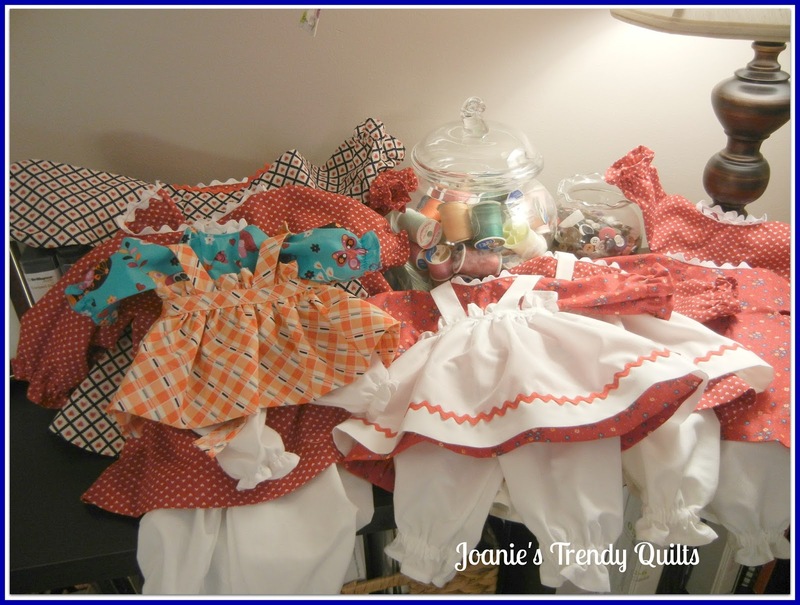 Currently showing are a completed set of 25" Raggedy Ann and Andy and 3 quilts. Oh, CONGRATS, Joanie!!! Sew happy to hear you had a custom order for that adorable pair. I did not think it would take long to make a sale. They are sew sweet! Good for you, girl! My goodness, this brings back memories! I have a Raggedy Ann and Andy hand-made doll set that my grandmother made me....57 years ago! And then she made a new set for my son and daughter. I displayed them for years, but right now they are in the cedar chest. Maybe I should get them out again. Your clothes are right on! What sweet outfits Joanie and I agree that anytime you can do assembly style sewing it is faster! Thanks for sharing. Your outfits are adorable! I'm sure you'll make lots of sales. Thanks for the recipe. Looks so good! Wow, you have been busy. I think you will do very well with these. When will the scones be done? 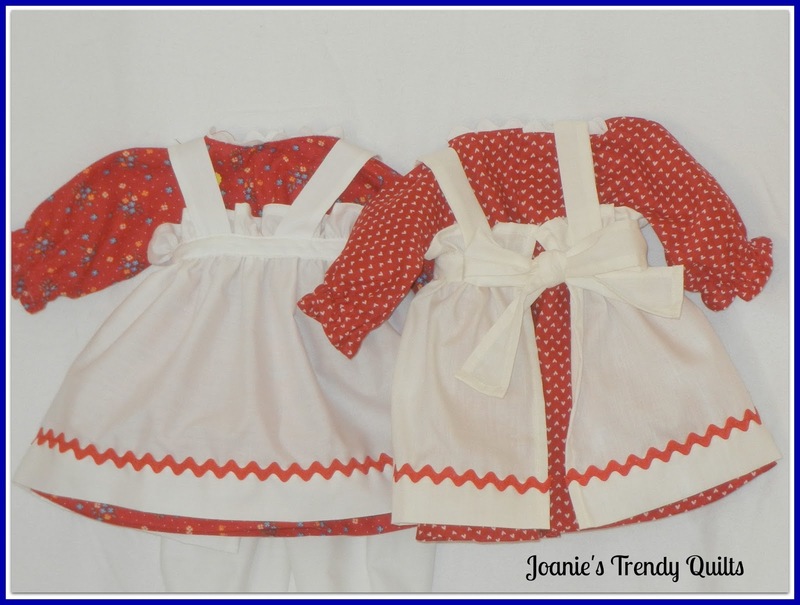 Joanie these outfits are spectacular! What a beautiful job you've done. RA & A clothes just adorable. 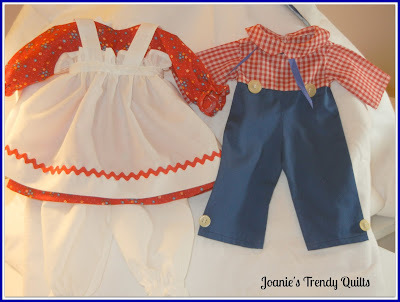 They would make cute Halloween costumes for the little twins I just made outfits for. Congrats on your first order.